Needing additional space to properly house your horses? 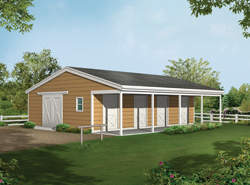 Our collection of horse stall plans features optimal structures with many including covered walkways, tack areas, and feed storage. Adding one of these plans to an existing barn or pole building is a great option and provides the additional space you may need when caring for horses. Take a look at our selection of designs and choose one that perfectly fits your needs. Our collection of horse stll plans includes many different types so finding the perfect one for your scenario should be easy. We offer detailed blueprints that allow the buyer to picture the finished project completed. With a wide variety of plans, we are sure that you will find the perfect do-it-yourself project to fit your needs and style.